I hope everyone had a great weekend! 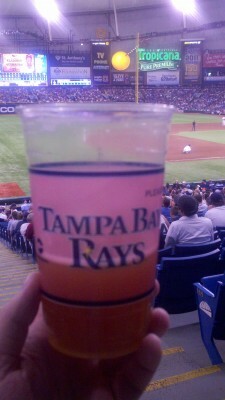 I spent two days this weekend at the Trop, watching the Tampa Rays playing the Orioles. The games were good (well, the first one was) and the better was awesome. They know have a semi-decent selection of craft beers – Bell’s, Brooklyn and hometown favorite Cigar City. Anyways, Fresh Brews is my weekly highlights of what’s been going on in the beer blogosphere. Enjoy! In case you are living under a rock, this is craft beer week! There will be events at bars and breweries across the country. No matter where you live, I can guarantee that they will be celebrating in your state! Here’s a list of all of the events. To celebrate Craft Beer Week, Logan over at Blog About Beer is going to drink and review 50 beers from literally all over the country. Anyone want to take the challenge with him? Attack of the gypsy brewers! Okay, I’ll stop being silly. Check out Beervana and find out what a gypsy brewer is how they brew their beer without having a home. I’m really trying to get better about watching my calories, except when it comes to beer. I can’t say no to a delicious home brew or craft beer, however if you were curious, Neil has some information on calories in beer.